Getting your gear change right means first and foremost better acceleration, better fuel economy, longer gearbox and transmission life. 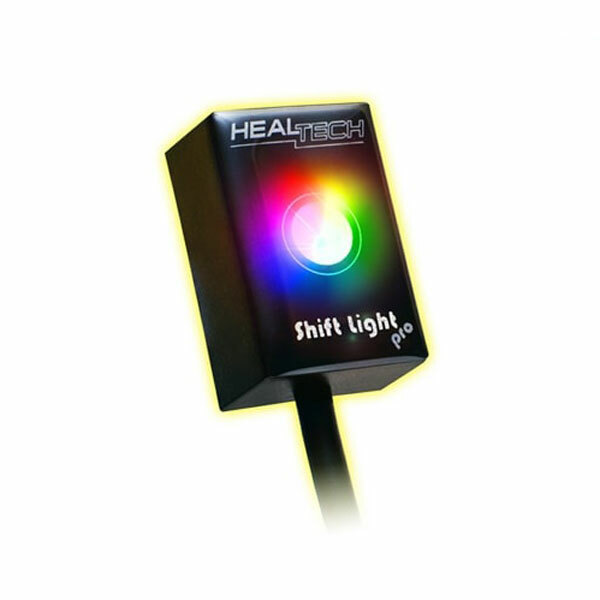 Meet the world’s smallest shift light module in a weatherproof casing with a fully custom programmable RGB Power LED. Can be programmed as a shift light for sport bikes and race cars or as a low/optimal/high RPM range indicator for touring bikes and other vehicles to get the best possible fuel consumption out of your machine. Indicates when the RPM is out of optimal range (too low or too high). Set up/Manage the device through your Android phone/tablet or a Windows PC via Bluetooth connection. Quick, easy and fun to use! Switch between saved profiles with a few taps. Features a true color SMD Power LED. One unit fits all motorcycles, ATVs, cars and other vehicles. Flash rate, Duration, Brightness and Color are fully adjustable for up to 3 different RPM ranges. The indication is fully customizable. Only basic installation skills are needed – locate 3 wires and splice them with the quick wire taps supplied. It has a simple and clear front face which goes along nicely with any OEM/factory instrument panel or aftermarket dash. The product comes in a rugged, 100% weatherproof housing and with a 2 year replacement warranty.